Conveniently located just off Interstate 83 and a short drive from Hershey Park and Chocolate World, this suburban hotel features many modern and thoughtful amenities, including free high-speed internet access. In the area surrounding the Hampton Inn Harrisburg-East/Hershey are a large variety of shopping centres, restaurants and golf courses. The Penn National Horse Race Track, the Civil War Museum and many recreational activities, such as ice skating and skiing, are also nearby. Guests at the Harrisburg-East/Hershey Hampton Inn can look forward to a free hot breakfast buffet after a restful night's sleep on the hotel's signature Cloud Nine beds. There is also an outdoor swimming pool and modern fitness centre located on-site. 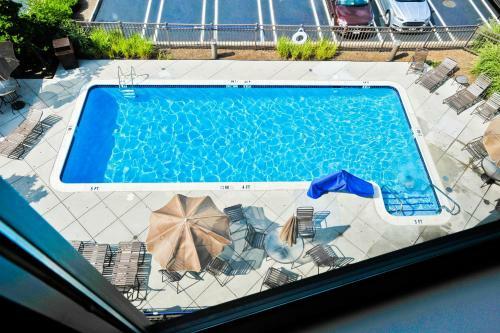 the hotel Hampton Inn Harrisburg-East/Hershey so we can give you detailed rates for the rooms in the desired period.